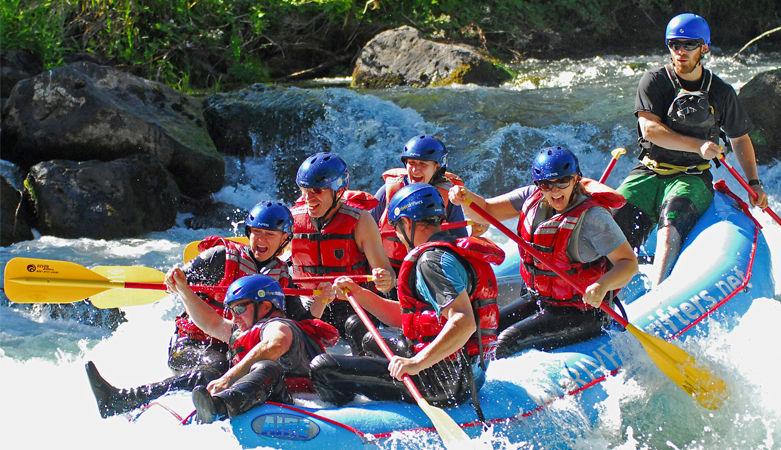 Rafting the White Salmon River is one of the best-kept recreation secrets of the northwest! The White Salmon River is located only 90 minutes from the Portland/Vancouver area. 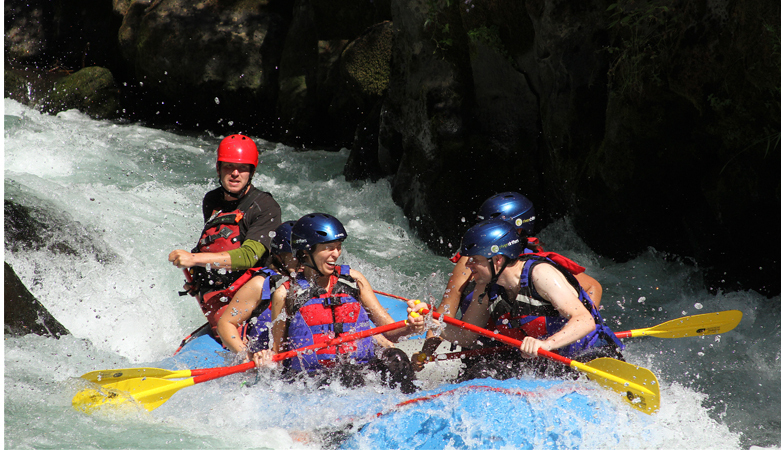 This river offers some of the best class III-IV rapids around and the glaciers of Mt. Adams combined with the immense aquifers in the area, keep the White Salmon bubbling all summer long! The river cuts its way through one of the most beautiful, constricted and heavily forested gorges around. The water is gin-clear, the weather is fabulous and rapids are big and numerous; making the White Salmon River one of the most exciting 1/2-day river rafting trips in the west! As the Spring days run long and the snow begins to recede, the water levels become lower and the trip becomes more playful. Its at this point (mid-Summer and Fall, when many Northwest rivers are reduced to a trickle) that we shift our trip dynamics a bit. We launch 2 miles upstream (beyond) the normal commercial launch to begin our trip deep in the canyon (thanks to some wonderful private property owners). By launching upstream, we add 2 more miles of class IV water (including rapids like S-turn, Top-Drop, The Flume, Bombers’ Drop and more)! 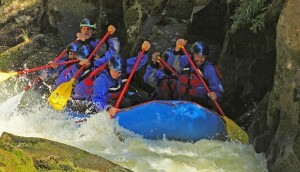 We also portage around BZ Falls, which is one of the most beautiful and picturesque sections of the river. We are extremely privileged and fortunate to offer this, not only for the extra rapids (and to give you more rapids per trip than anyone else) but we truly get to enjoy a canyon untouched by man. 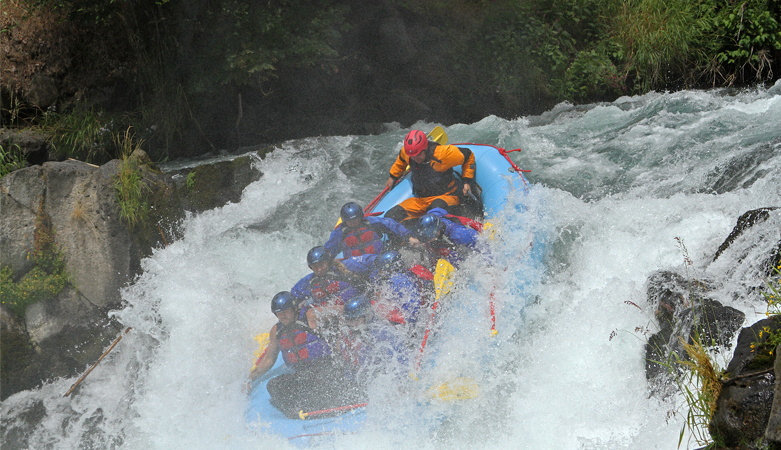 When water levels are low enough to safely offer Husum Falls, an exciting grand finale will conclude the run. Husum Falls is completely optional and you must meet certain age guidelines to paddle this drop, many people walk around and sometimes the entire boat will portage this rapid. 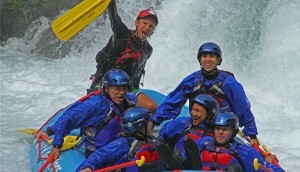 In short, this trip is all fun and offers the most rapids! Trips run daily, starting in March and lasting into November, meeting at 9:30am or 2:30pm! 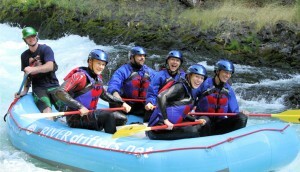 In the Spring, the river tumbles and charges its way down a narrow basalt canyon. The rapids are big and bouncy with many large waves and powerful holes. 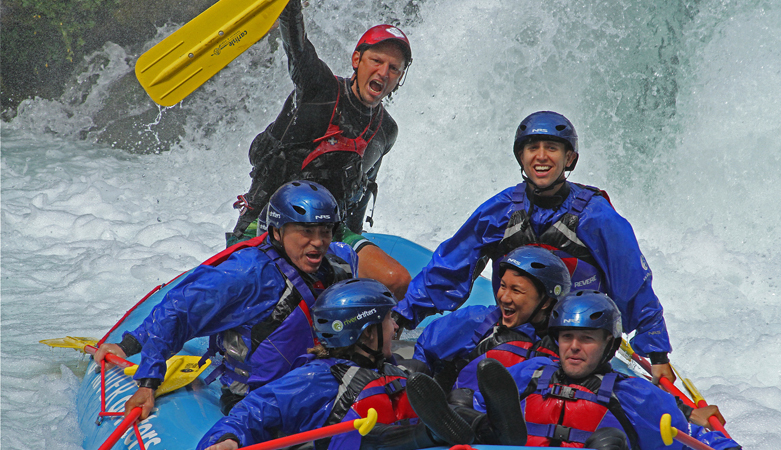 With rapids like Maytag, Corner Cave, Grasshoper, Siwash, Corkscrew, Waterspout, Stairstep, Highway Hole, Rattlesnake and Deadmans’ Corner (and many more), thrillseekers love this trip. This is an eight-mile trip with the first five miles consisting of continuous class III+ and IV rapids. Trips run daily, starting in March and going into Mid-October. 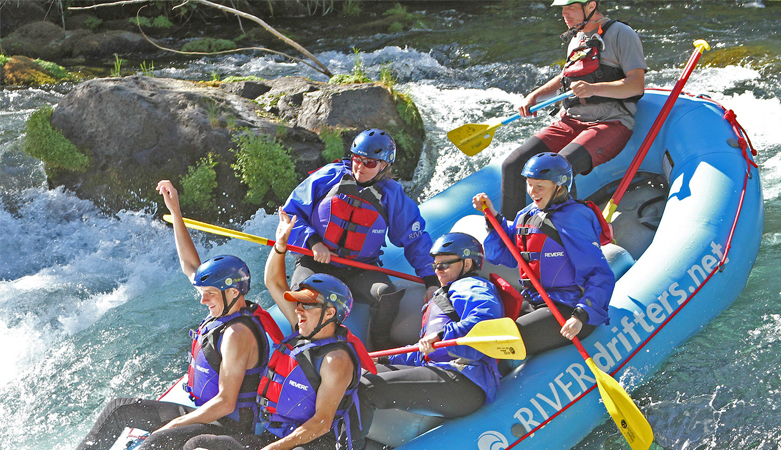 A full-day rafting trip on the White Salmon River offers countless big rapids, unmatched scenic beauty, and the rare chance to see a once-dammed river returning to its natural state. The breaching of the Condit Dam in 2011 revealed a spectacular, narrow canyon below what used to be Northwestern Lake. The section of the White Salmon from the old dam site to the Columbia River—known as the Lower-Lower White Salmon—is constantly changing, offering boaters a rare opportunity to see wildlife and plants returning to this section of the river. 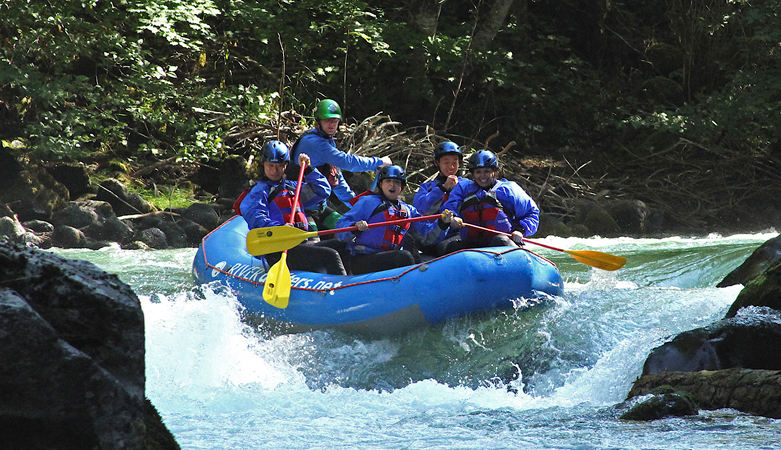 For this and many other reasons, nature-lovers and thrill-seekers alike love the full-day White Salmon River rafting trip. 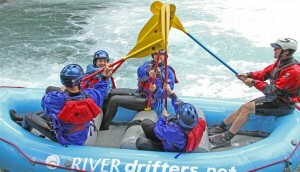 This is a 15-mile trip with many class III+ and IV rapids. Trips run daily, starting in June and continue into November. The Columbia River Gorge offers numerous camping sites. 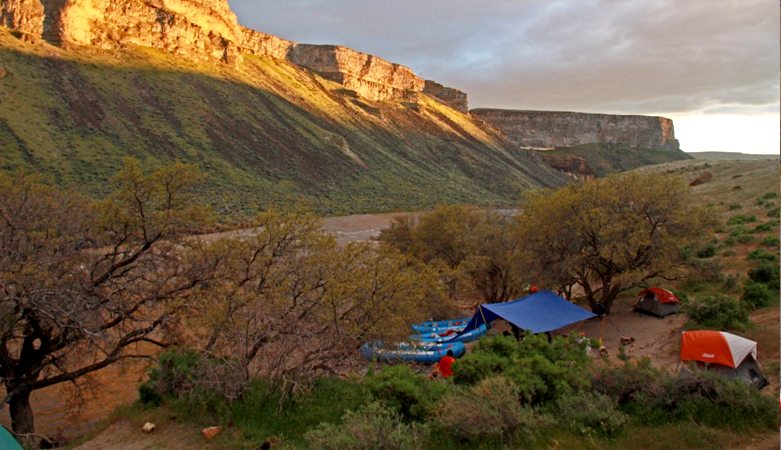 There is a large number of free camping areas as well as designed campgrounds (with running water, RV hook-ups, ect.). Below is a compiled list of some of the camping options in the area. Remember that that list below is just a start, there are plenty of great camping areas. For more information call the Hood River County Parks (541-386-6073), consult with your favorite camping guidebook or give us a call! Home Valley Campground: This is a wonderful campground with shade, some wind protection, beach access to the Columbia, amenities, a walk to a general store and access to great hiking. Certainly one of our favorites and 30 minutes from our White Salmon Shop! Viento State Park: Located on the Oregon side of the river, this superb campground is within a 30 minute drive to our White Salmon shop, shaded, some wind protection, great nearby hiking and ten minutes from Hood River. One of our top pics! 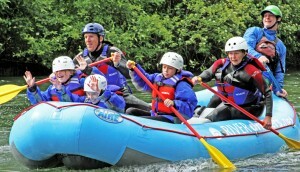 Memaloose State Park: Just East of Hood River, is another great camping location on the Columbia River. Full amenities, beautiful location with great access.